Having been a wood worker for many years in the Pacific, Dan Graham began working with cedar shortly after arriving in North Carolina. The eastern red cedar that the Grahams use is commonly found in this area and is strongly aromatic. At our Timber King sawmill, logs are first selected for size, quality, and maximum heartwood. 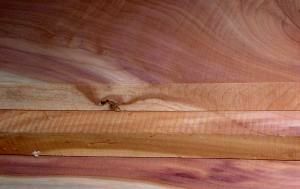 Select boards are then planed, cut to length, and matched for the panels that comprise the front, back, and ends. 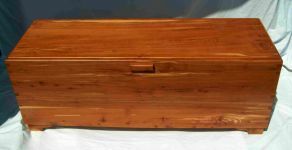 The panels are then mitered at the corners, glued, and secured with cedar dovetail keys that form a permanent bond without the use of nails. 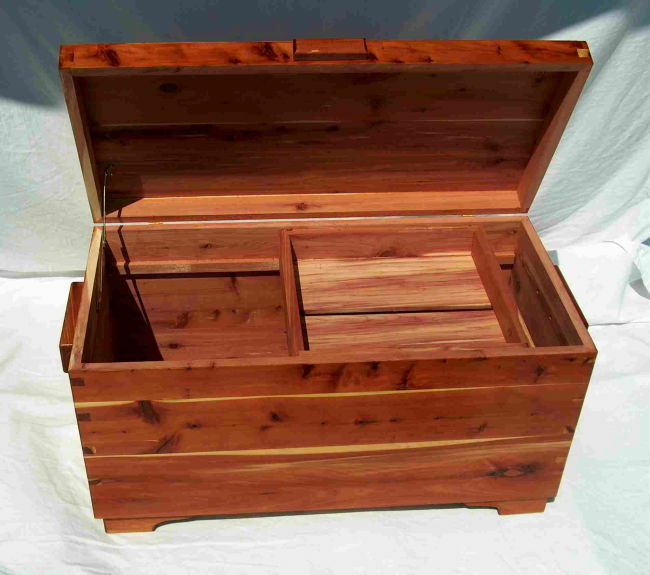 Finally, when the chest is fully assembled, the top is cut off, thereby making a perfect fit with uniform appearance. All hardware is solid brass and the finish is total lacquer. A small sliding tray fits in the top level of the chest to accommodate quick access to special stored items. 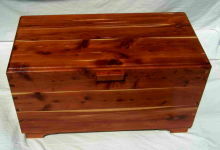 Our chests have a unique quality compared to the highly glossed and decorated factory-made or imported ones. 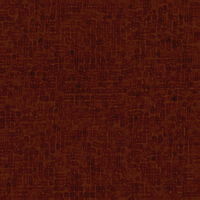 These are often made with thin veneers on particleboard, with the thinnest of cedar lining, or even worse, cedar particleboard. 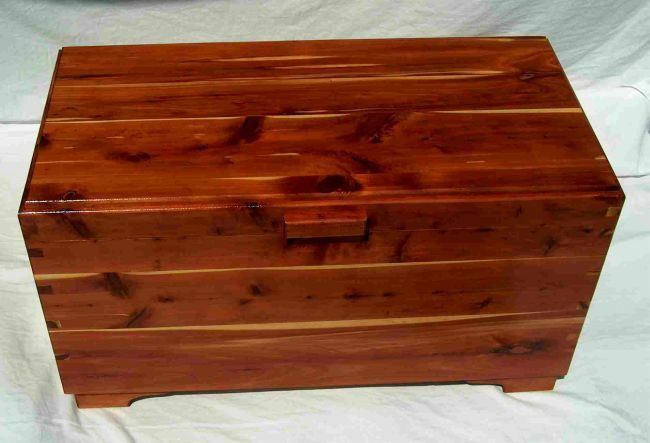 Our chests are solid cedar, predominantly red heartwood, at least 3/4" thick. No particle board, veneers or cheap industrial shortcuts, just plain natural materials and intensive hand skilled labor. 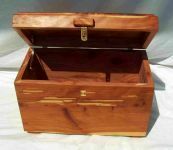 Our chests are often purchased as anniversary gifts for loved ones to be appreciated for years to come and we handcraft them accordingly. 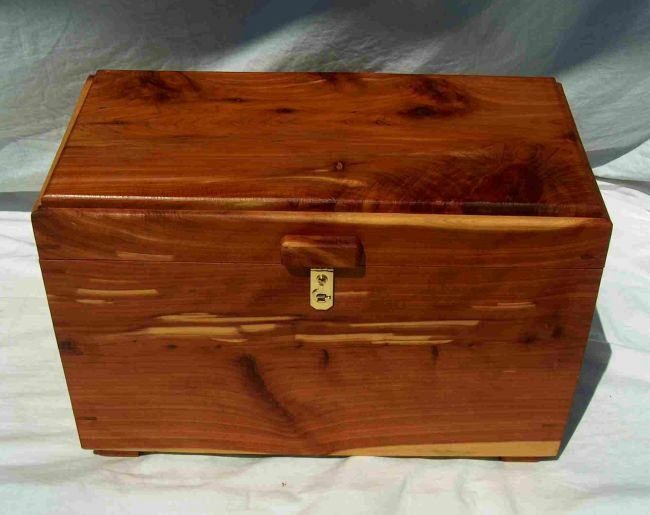 Cedar chests are made in the following sizes. 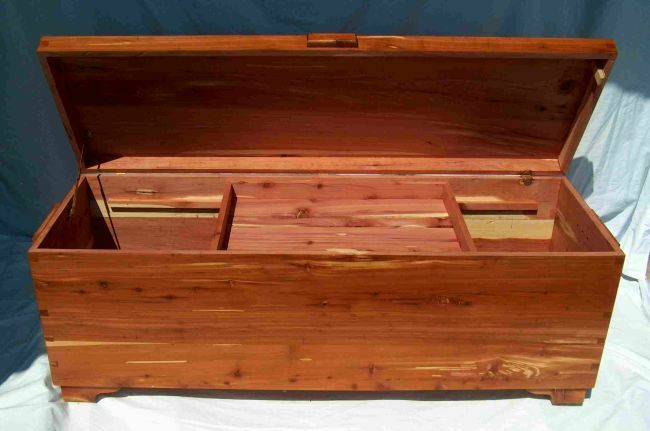 The LxWxH measurements shown below include the 2 handles, which are built to the sides of each chest. The miniature chests do not have handles. 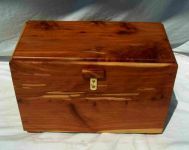 Miniature Chests are 19" x 9.5" x 13" (14lbs.) $175.00 plus $55 packaging & shipping ($230.00 total). Small Chests are 35" x 16" x 18" (41 lbs) $342.00 plus $142 packaging & shipping ($484.00 total). 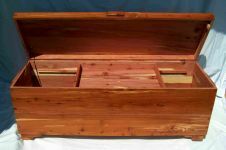 Medium Chests are 42"x 18" x 20" (56 lbs.) $392.00 plus $175 packaging & shipping ($567.00 total). * Large Chests are 54" x 18" x 20" (75lbs.) $462.00 * No shopping cart feature -- local pick up only.